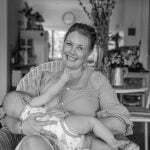 'Breastfeeding is the hardest thing I've done. So I posed for this image'. It might seem strange that a mum who designs, makes and sells breastfeeding covers as a ‘side hustle’ would have some photographs taken of her breastfeeding uncovered, then share them on the world wide web for all to see! Considering I am a primary teacher, usually quite modest and live in a small town, I did think for a moment that maybe this might not be appropriate. I then thought that I wanted to share how proud I am of my body for growing two beautiful babies, sustaining this baby solely for his first five months earth side, show just how amazing mother mature is, and maybe even help a fellow mum who might be having a rough trot. Initially the photos were just for me, but they turned out so naturally beautiful that I thought they should be shared to help all women, mothers or not, be proud of their bodies and whatever they’re able to accomplish with them. I gave birth to a bouncing baby boy weighing 4070g in June 2017. The 207 days since he was born have been the most grueling, challenging, exhausting and happiest of my life. On the day we were due to come home from hospital, he fed at 8am then fell asleep. A few hours later as we were packing up to go home, I tried to feed him again before leaving and he didn&apos;t want a bar of it! I tried every trick in the book, to no avail. When he&apos;d not fed for eight hours, I began to panic. I phoned the Australian Breastfeeding Association from home and they suggested that he&apos;d more than likely gone on &apos;nursing strike&apos; which of course I had never heard of. She told me to both take our clothes off and that I should lay with him on my chest in a quiet, calm room. My son and I slept in bliss for two hours. He then woke on his own and began to crawl down towards my breast, latched himself and fed for Australia! It was truly incredible to witness and proof of the powers of mother nature. There was a stage where our son was feeding every 50 minutes and looking back on it, I&apos;m not sure how everybody in this house had clean clothes, food to eat and appeared to be happy! I am however a firm believer that we aren&apos;t given things in this life that we can&apos;t handle - I know that really helped to get me through. He has pushed me to my absolute limits. Our son is starting to slowly wean himself from breastfeeding as he is eating more solids and drinking more water. I have a deep sadness in my heart knowing my feeding days with him are coming to a close. I think it is only a sadness a mother would know, and it is difficult to put into words. We&apos;ve spent hundreds of hours, just him and I, in the quiet and darkness of his room. I know his every movement, I know his every sound, I know his every signal. I want to hang on to it for the rest of my life, but probably like everything it will gradually fade. At night while he’s feeding, I look at him and know I could stare at him for the rest of my days and still not feel satisfied. And so I asked my very talented sister in law to take some photos of him feeding this week to help me remember what it was like in the years to come. Our son doesn&apos;t feed well in public now, he is too easily distracted. Before we started, I told her she only had a matter of minutes before it would all be over, and not to speak a word. She whizzed around us snapping in a flurry and I&apos;m so grateful for what she was able to achieve in such a small window. LISTEN: On This Glorious Mess, the creator of the Kids Alive campaign shares his best advice for keeping kids safe around water this summer. Post continues below. When I realised our son was weaning, I was devastated. I thought I had failed him and had it in my head that I was supposed to go for so much longer yet. After these photos were taken, and seeing the finished product I realised that I really am so blessed that I have been able to breastfeed both of my children, regardless of the time frame. I also felt empowered and in awe of what my body has done and as it turns out, I haven’t failed at all – I’ve succeeded! I make unique breastfeeding covers which are popular sellers but I personally don’t cover from embarrassment rather for comfort, confidence and security. It is only now, after spending 17 months of my life breastfeeding two big babies, and counting, that I can look back, see what my body has achieved and be bloody proud of it. Ebonnie Whan is a a mum to a 3.5 year old girl and 7 month old boy. She is a primary teacher by trade and runs Nandewar Nursery from home. Images by Shanna K Whan.